Gerard Schwarz has transformed the Seattle Symphony into a superb Mozart orchestra that now rivals the Royal Philharmonic of the Beecham era. The strings are gorgeous: silky smooth, luxuriously rich, and wonderfully seductive – certainly a welcome relief from the scrawny string bands foisted upon us by the period instrument crowd. (It's strongly recommended that all authenticists have their cholesterol levels checked immediately after listening to this disc.) Meanwhile, Seattle's solo winds display astounding personality, sparkling wit, and vitality. 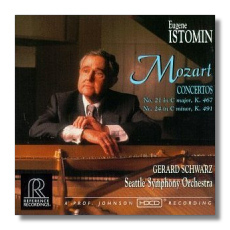 In addition, maestro Schwarz is a seasoned and skillful Mozart interpreter. In general his (or should I say, Istomin's?) tempos are not fast, but he nonetheless invests the tuttis with a welcome spontaneity and gentle sense of humor. Indeed Schwarz's sly, conspiratorial pianissimos and asides in the finale of Concerto 21 remind me very strongly of the comical interjections of Leporello in the opera Don Giovanni. Through it all, Istomin remains almost totally aloof from the many intrigues swirling around him in the orchestra. Dramatic outbursts and wild contrasts of mood in the piano part are downplayed. Despite the crystalline clarity of Istomin's playing – which reveals many details overlooked by others – and the shimmering sound of his instrument, I miss the poetry of Géza Anda in the slow movement of Concerto 21, the sheer bravado of Perahia in that work's outer movements, and the pyrotechnics of Czech pianist Pavel Stepan in Concerto 24. Istomin seems far more engaged and alert when playing the cadenzas, at least in Concerto 21. These cadenzas are quite unusual in that they combine the best work of several different artists, including Paul Badura-Skoda, Lillian Kallir, Claude Frank, Leopold Mannes, and the soloist himself. Reference's recorded sound is warm and inviting – just right for this sublime orchestra. Balances are excellent. I do, however, detect a gentle "whooshing" sound between movements that is most noticeable when listening through headphones.